See attached screenshot. It's like that, all the way across the top panel. 2) Close your current session and start Gnome-Classic Session in LightDM. 3) Look at the top left GNOME panel. 4) You should see the white text "Applications" and "Places" on dark background. The fix can lead to a regression in the visual appearance of the GNOME panel in the Classic session. 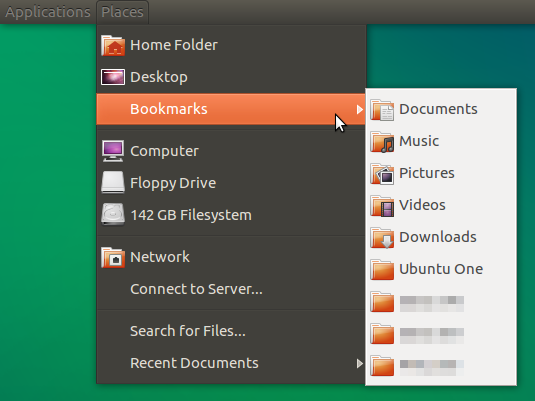 Other sessions could not be affected because these changes apply to a CSS file only used by gnome-panel. Now that this bug has been fixed for Quantal, what will we need to do in order to get the same package into precise-proposed? The bug affects me (and, likely, others) specifically in Precise, but I have already indicated that the bug affects me. I will prepare an update for precise-proposed. Per the SRU process at https://wiki.ubuntu.com/StableReleaseUpdates , please add a [Test Case] and [Regression Potential] to the description of this bug. The upload will not be accepted to precise-proposed until that is done. Thanks! The required information has not been added to the bug despite a request nearly two weeks ago. I'm rejecting light-themes from the upload queue. It can be reuploaded once the linked bugs are in the correct state. Please don't use 'fix committed' for Ubuntu stable release tasks, this value is used by the SRU process with a separate meaning. This particular line is explained by bug #986988; the other color changes are not. Accepted light-themes into precise-proposed. The package will build now and be available at http://launchpad.net/ubuntu/+source/light-themes/0.1.9.1-0ubuntu1.1 in a few hours, and then in the -proposed repository. I have just installed the proposed fix from precise-proposed on my 12.04 laptop, and I can confirm that the fix works. I don't notice any further issues. Thanks much! I, too, can confirm that the new package resolves the issue described in this bug report. I hope to see it progress from -proposed soon. * Switch dpkg source format from 3.0 (native) to 3.0 (quilt).